When I knew I got a job, I made a to-do list to accomplish for finally being on vacation. It included a list of fun things like reading books and not so fun things like going to the dentist. So let's see how I did shall we? I read Let it Snow by John Green, Maureen Johnson, and Lauren Myracle and I also read The Book Thief by Markus Zusak (I loved both of them). I just started Joseph Conrad's The Heart of Darkness. I had Dessert Day. I went to Williamstown. And I skyped with by best friend twice. In other words, I had all the fun. I added important dates into my new diary (or daily planner) which is always one of my least favourite jobs for some reason. I feel like one of the last people left who use a paper planner. But man I love checking things off. I went to the dentist (still no cavities!). I got my hair cut, and I don't like it. Ugh, I hate that. I have notified both doctors that I need to change appointments, but no new dates have been selected as of yet. I researched how to clean my Kitchen Aid food processor handle and basically the result was it can't be done. I cleaned the fridge and the bathroom. I'll give this vacation an A+. So glad you had an awesome vacation my friend! i do this too! i need to make sure that i get stuff done when i'm off or i'm just going to lie around and do nothing. When I saw the title of your post on my blogroll, I immediately assumed you were talking about ticks as in those little bugs that give you Lyme disease. This is likely because I have 4 pets and ticks are usually on my mind (at least in the warm weather lol). No kidding! You actually accomplished your To Do list!! This is a rarity in the blogging community.. lol. Or at least in my experience..!! Good job. I looove putting important dates in my planner. Every time I come across another one at work I get super excited to write in it. This is my life. I love that you are a list maker. I am too. I love crossing things off my list because it is just so satisfying. Glad you had a good staycation! 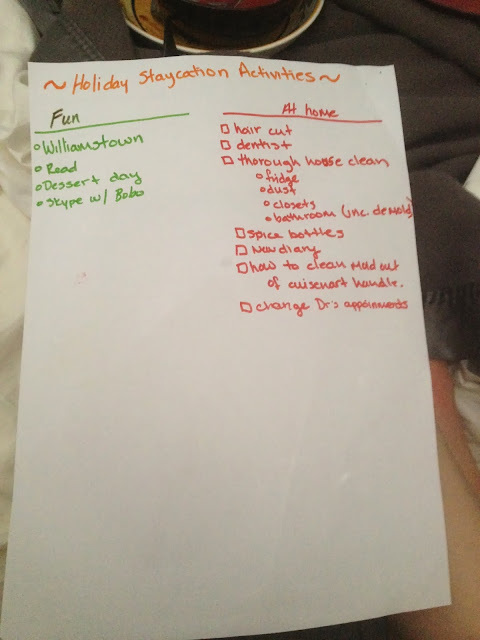 I also made a list of things to do around the house while I was on leave from work! :) I did 98% of it. Well done on your accomplishments. You did awesome on that to do list! I am almost done with the Book Thief! And by almost done I mean that I have 150 pages left. But I feel like that is such great progress...lol. I love it! I created a paper planner/binder. You are SO not alone with that!